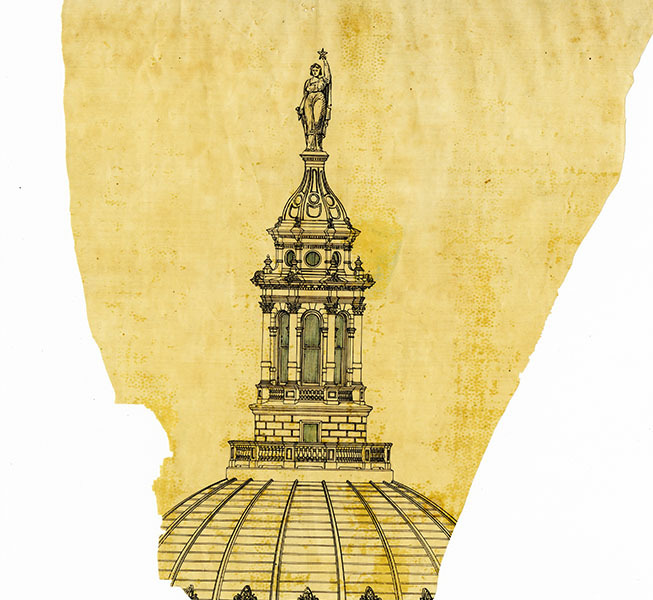 Elijah Myers' drawing of the Capitol featuring a Goddess at the top, c. 1881. 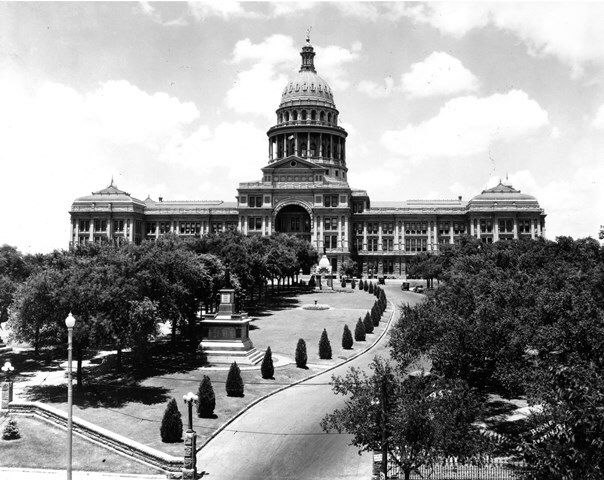 Image Courtesy Texas State Library and Archives Commission, 2014/001-64-148. 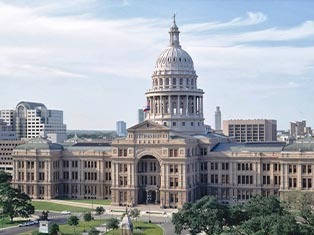 Architect Elijah E. Myers designed the Goddess of Liberty as the crowing element of the Texas Capitol. The State of Freedom on the National Capitol, the Statue of Liberty and the Pallas Athena from ancient Greece all likely served as inspiration for Myer's design. 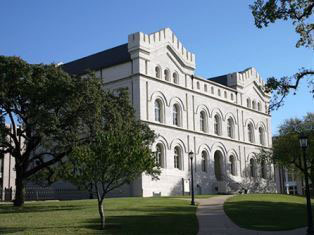 Image Courtesy Texas State Library and Archives Commission, 1965/90-1. Metal contractors created a foundry in the basement of the Capitol to prepare the Goddess of Liberty. Using plaster molds from Chicago, they cast 80 separate pieces in zinc. They welded these parts together into four major sections: the torso, the two arms and the head of the statue. A crew hoisted each section to the top of the dome and used large screws to put the nearly 16 foot tall statue together. 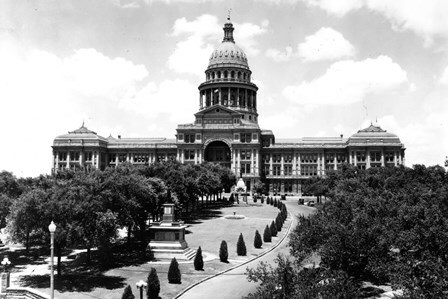 The south façade of the Capitol, c. 1935. 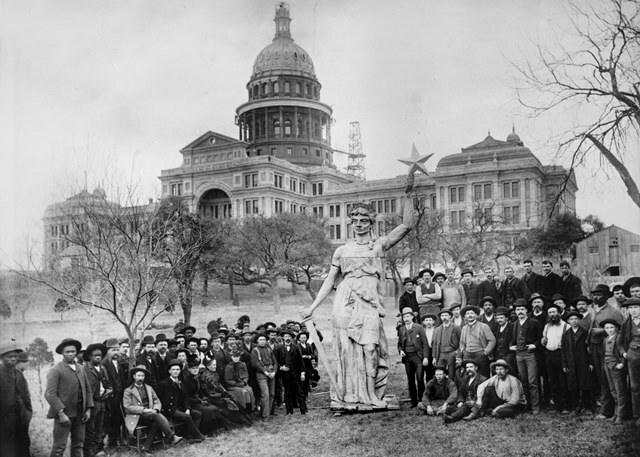 Image Courtesy Austin History Center, Austin Public Library, Walter Long Collection PICA 18583. 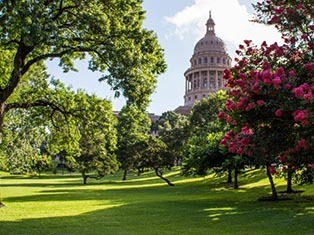 Texas hired steeplejack "Cyclone Jack" McCarthy to paint the Goddess. 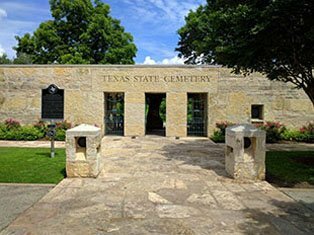 He stood on the head of the Goddess with one hand on the Lone Star and performed other stunts while hanging from the statue's uplifted arm. Several years later an unidentified painter provided the Goddess with black hair, pink skin and a blue robe with a gold sash. 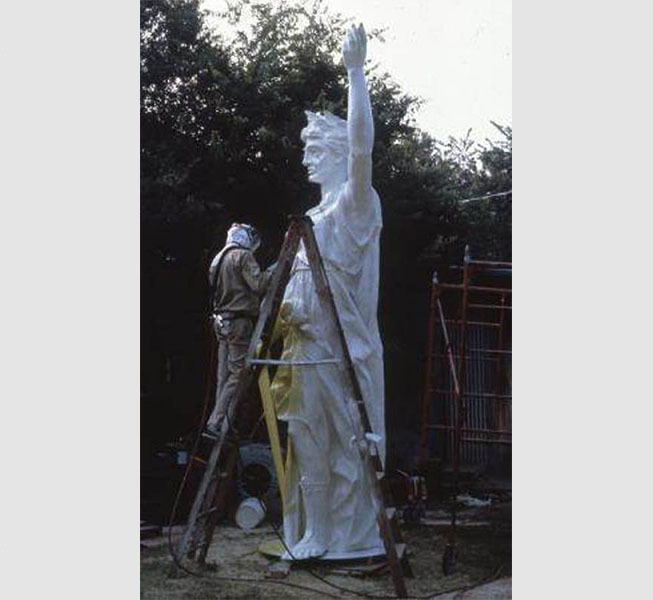 In 1939, workers returned the Goddess to a white color, which has remained since. 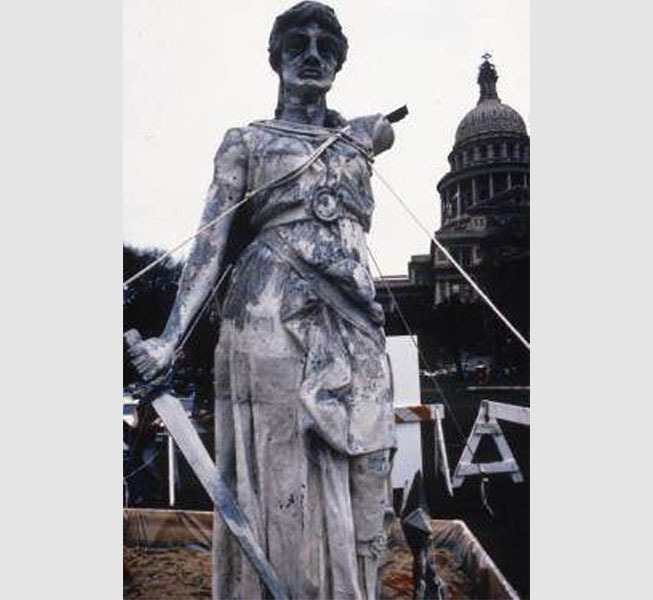 The poor condition of the Goddess of Liberty, 1983. Workers painting the dome noticed extensive cracking along the back of the arms, right hand and sword of the Goddess. 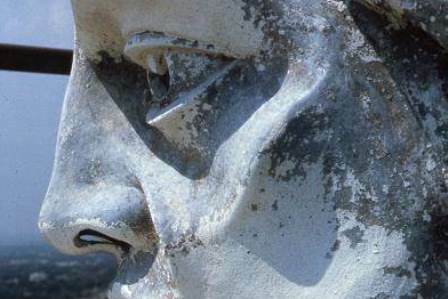 A study of the statue revealed corrosion, tears, lost fasteners and missing pieces. 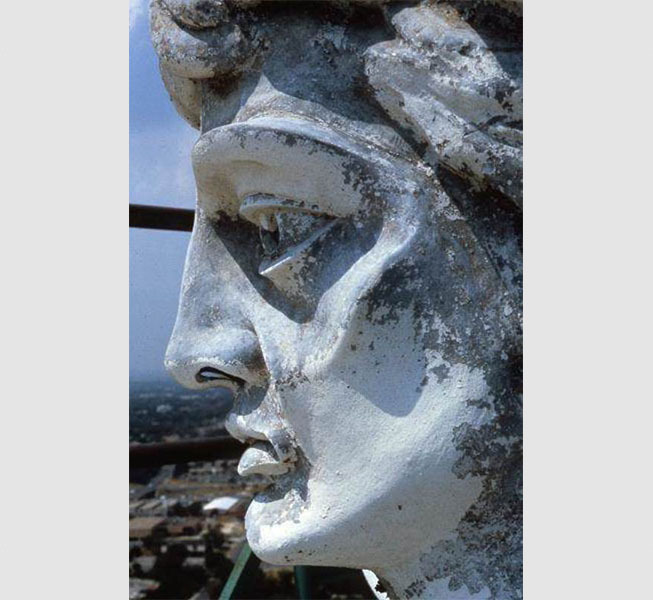 Impurities in the original zinc alloy, as well as atmospheric pollutants, lightning, temperature changes and wind all contributed to the deterioration of the iconic symbol. The Goddess on the south Grounds, 1985. 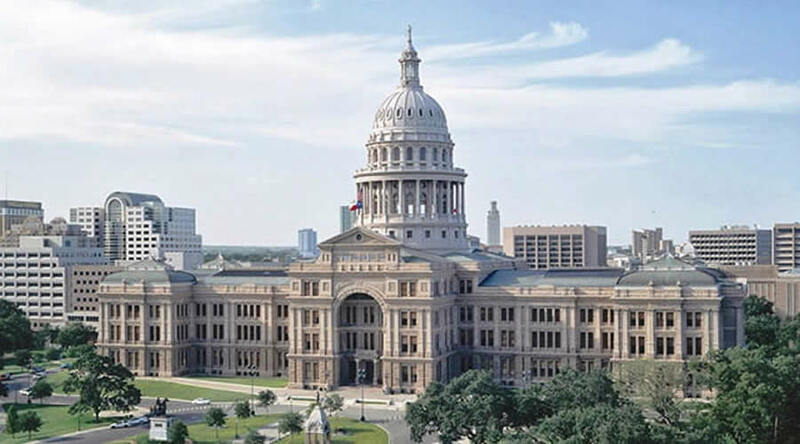 The State Preservation Board determined to install a replica of the Goddess on the dome and place the original in a controlled interior environment. Workers placed the Goddess in a structural support with nylon strapping and removed the upraised arm and the sword. 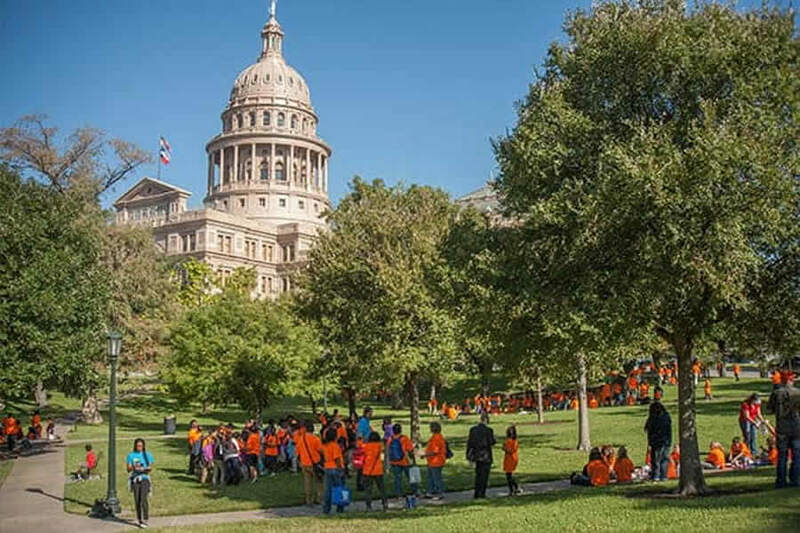 A Texas National Guard helicopter lifted the Goddess safely from the dome and placed her on the Capitol Grounds for temporary viewing. Workers creating the new Goddess, c. 1986. Workers cast an accurate replica of the Goddess. 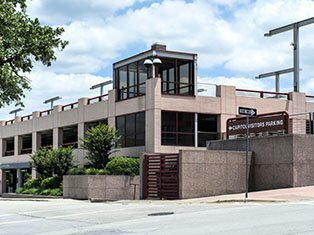 The foundry used a high-strength, corrosion-resistant aluminum alloy donated by Aluminum Company of America. Standing at the same height as the original, the replica Goddess weighed less due the use of the lighter material. 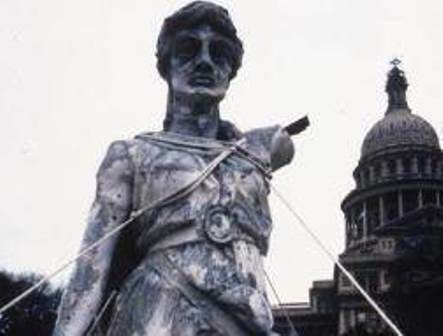 The initial attempt to place the replica Goddess of Liberty on top of the Capitol using a helicopter proved unsuccessful due to high winds and the lack of precision winch. Two weeks later, the Mississippi National Guard used a "Skycrane" helicopter to successfully install the statue. 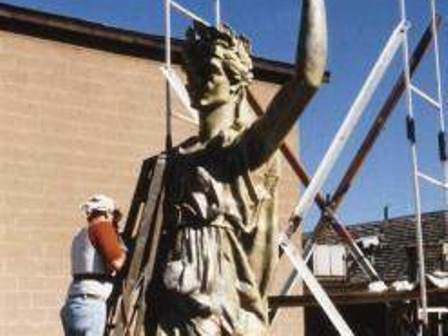 Restoration of the original Goddess, c. 1987. 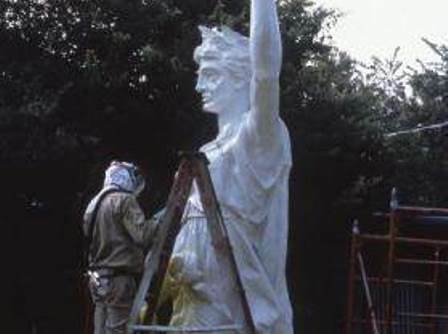 Experts restored the original Goddess of Liberty by removing paint, dirt and oils. The statue received a corrosive-reducing primer and paint that including tiny glass beads to safely simulate the fine sand additives originally used. 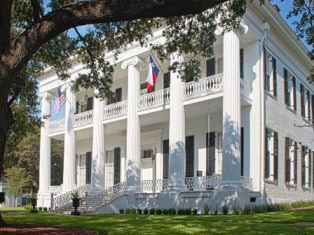 The restored Goddess of Liberty is now on display at the Bullock Texas State History Museum . The hand and star of the original Goddess on display at the Capitol Visitors Center, 2015. 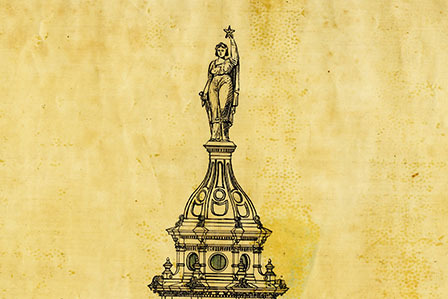 Preservationists discovered a time capsule in the star of the 1888 Goddess of Liberty. The time capsule included newspapers, calling cards and a broadside. 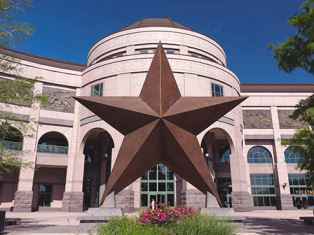 The State Preservation Board did not restore the original star and hand in order to keep it as an artifact showing the condition of the statue in the 1980s. 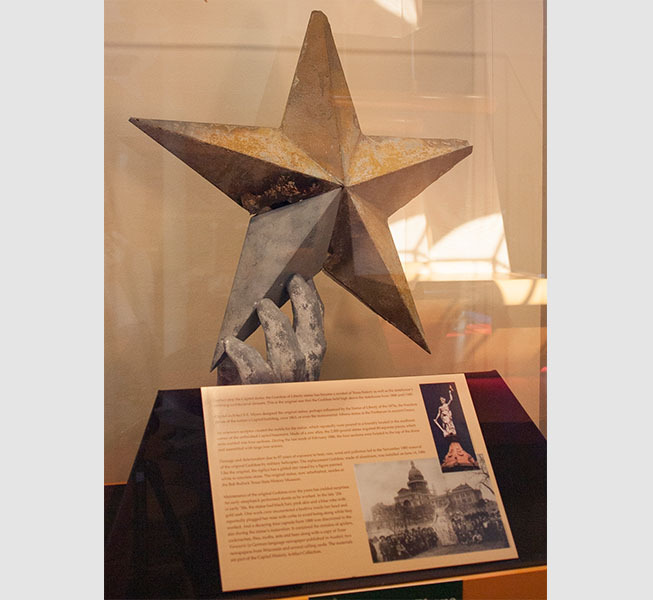 The star and hand have been are currently on display at the Capitol Visitors Center. The Goddess before being repainted, August 2010. The 2010 dome project allowed for a close inspection of the Goddess 24 years after she topped the Capitol. State Preservation Board officials accessed the condition of the statue. 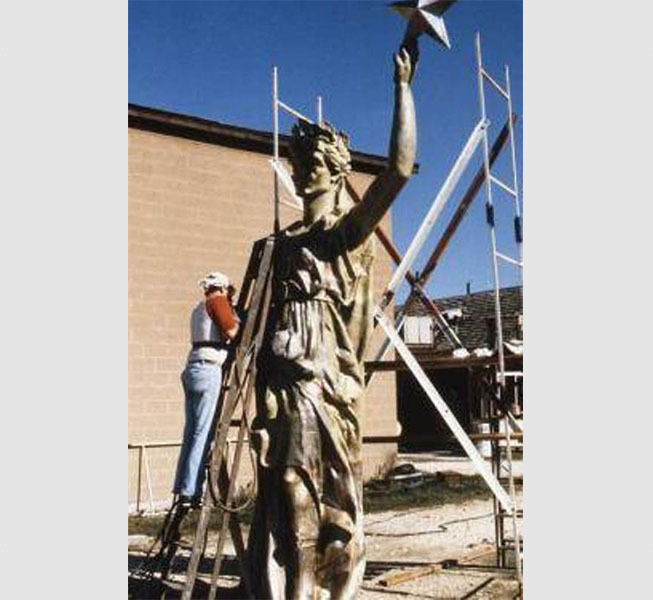 Workers then re-painted the Goddess ensuring she will remain an enduring Texas symbol.